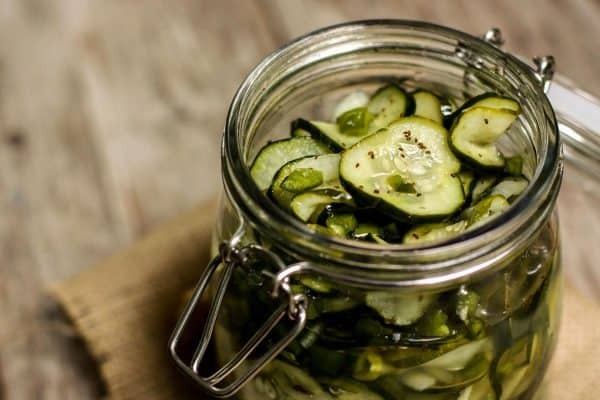 This recipe for Refrigerator Sweet Pickles is a perfect way to preserve all those fresh end-of-summer garden cucumbers. The sweet pickles come together in quick and easy fashion, with a short list of ingredients. And there’s no need for any fancy equipment! A number of years ago, my family – to include both my sisters and their husbands and kids – rendezvoused at my parents’ home in South Dakota. It was early August, in the heat of summer. And our entire family hadn’t been altogether for way too long. For a few short days, we stepped away from routine to enjoy time together playing games, taking walks, swimming, catching fish, and just plain catching up. Dad and Mom left no plate unturned, filling us up like only going home can do. It was during this visit that I was reminded of, and treated to, Mom’s Refrigerator Sweet Pickles. It had been yeeeeeears since I had enjoyed them. How could I have possibly forgotten about these crunchy summer bites that I grew up with?! Well, I’m not ashamed to say that I ate more than my fair share of Mom’s pickles. I spooned that tangy goodness onto my plate as if it were a salad, each and every meal. Such is the case with me and pickles. Set some Pickled Squash in front of me. Or Pickled Asparagus. Or these Pickled Red Onions, that I’m never without. And I’m a happy prisoner to their pickled goodness. So, before we left, I asked Mom for the recipe. Seems like every time I visit Dad and Mom, I take at least two or three recipes back home with me. 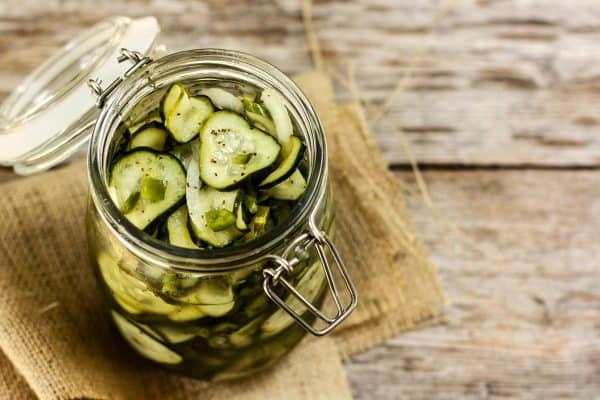 This recipe for refrigerator sweet pickles is a perfect way to preserve all those fresh end-of-summer garden cucumbers. The pickles come together in quick and easy fashion, with a short list of ingredients. And there’s no need for any fancy equipment. 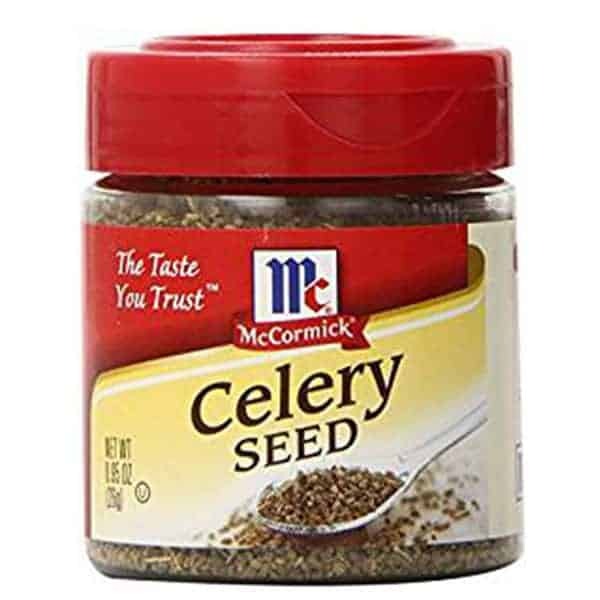 Just make a simple pickling brine on the stovetop – I love the celery seeds in this! Pour it over sliced cucumbers and onions (use a mandoline for quick, even slicing! ), plus some chopped green pepper. 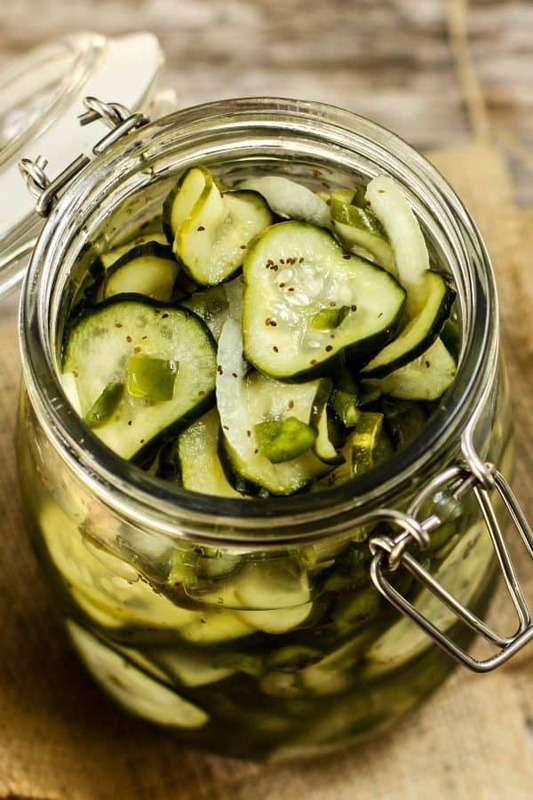 Let the pickles cool to room temperature before chilling in the refrigerator. And you’re done! THAT. Is the beauty of refrigerator pickles. I like to eat these refrigerator sweet pickles absolutely any time of day, from breakfast to supper. The pickles are great with a plate of breakfast eggs. 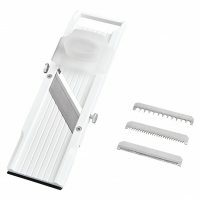 They’re an excellent topper for burgers, hotdogs, egg salad sandwiches, tuna salad, and fried chicken sandwiches. 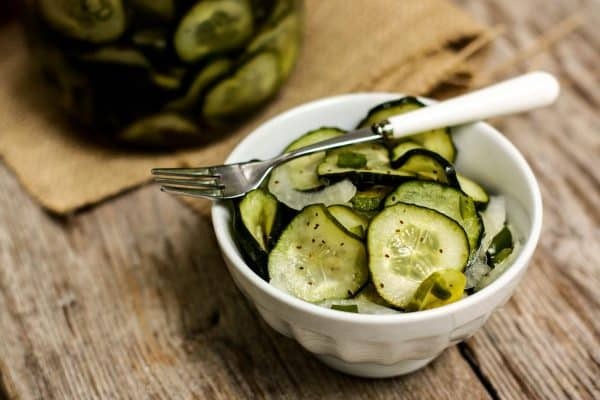 Anytime you’re looking for a fresh, bright, tangy contrast…these sweet pickles are your friend. 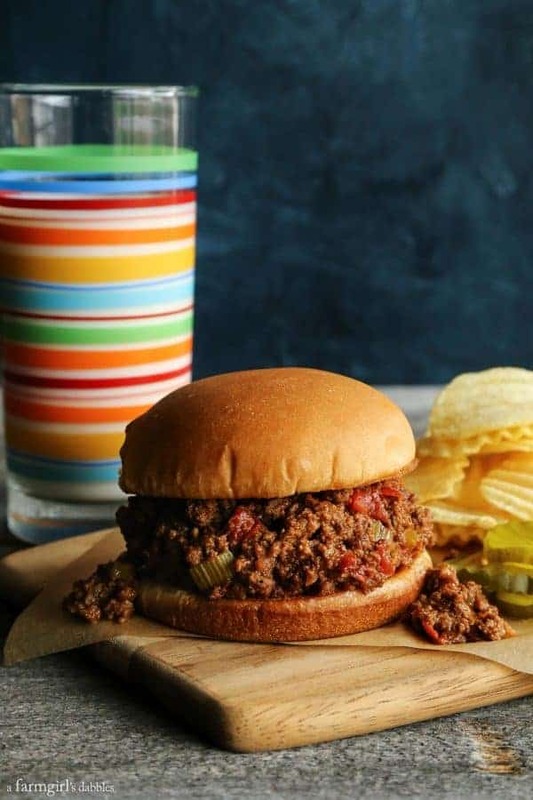 One of my very favorite combinations, though, is to serve Mom’s sweet pickles with slow cooker sloppy joes and thick, rippled potato chips. It’s the very best food trio! Like these Refrigerator Sweet Pickles? Pin it! 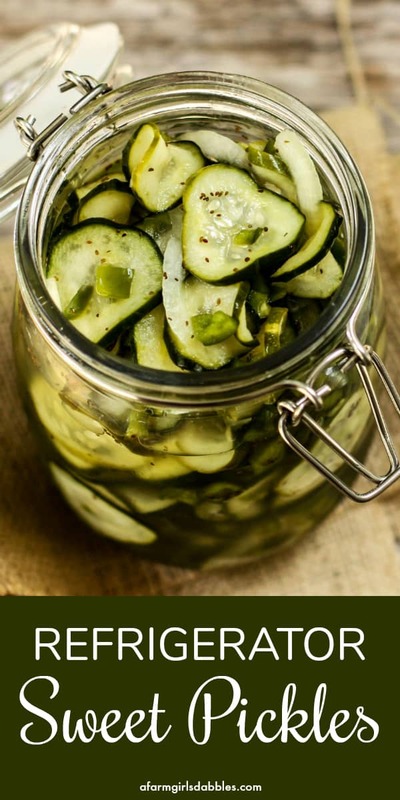 What a great way to preserve all those fresh end-of-summer garden cucumbers! 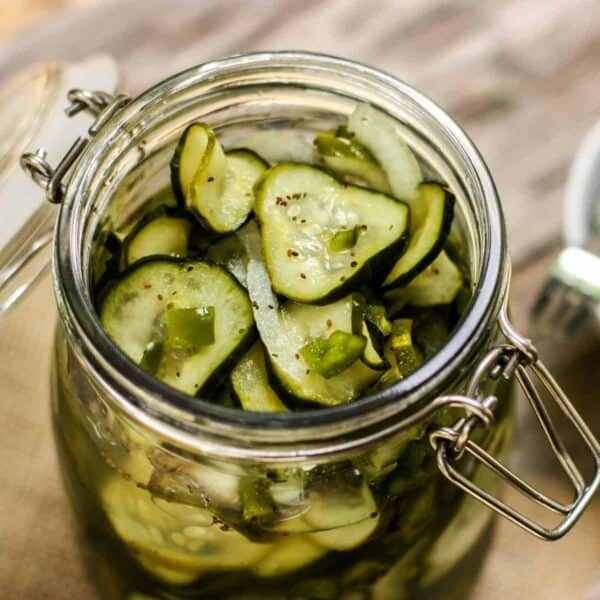 This sweet pickles recipe comes together in quick and easy fashion, with a short list of ingredients. And there's no need for any fancy equipment! 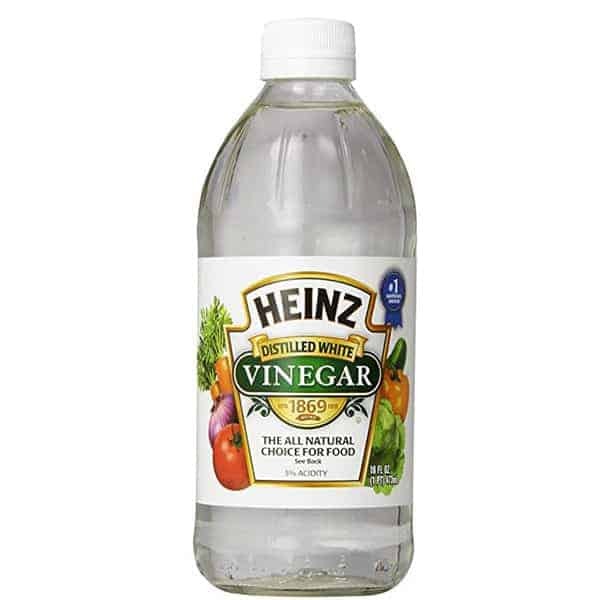 In a medium saucepan over medium-high heat, heat the sugar, vinegar, and celery seed. Stir occasionally. When the sugar has completely melted, pour the hot mixture over the cucumbers. Add the dill. Let cool to room temperature. Place a lid on the bowl and refrigerate for 2 days before eating. Eat straight from the bowl, or transfer to jars if desired. You could also transfer the room temperature mixture to jars before refrigerating for 2 days. Pickles keep very well for a few weeks. Please leave a comment on the blog or share a photo on Instagram with the hashtag #afarmgirlsdabbles. 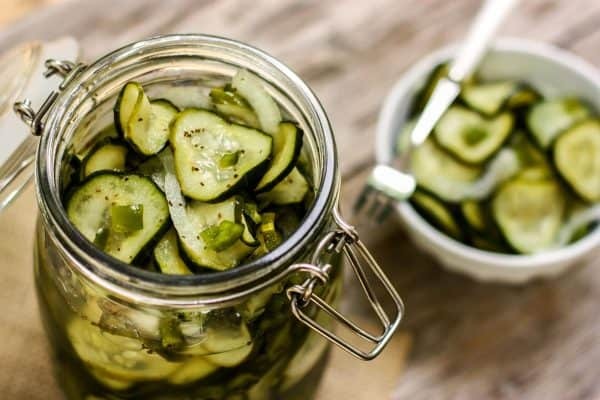 If you liked this sweet pickle recipe, you might like: Homemade Claussen Knock-Off Pickles from Foodie With Family, Killer Spicy Garlic Dill Pickles from foodiecrush, and Gin and Tonic Refrigerator Pickles from the view from great island. So many fun recipes!